Today, I went out shopping by myself. I started out very late in the day, I was up to go by 10 am this morning but I was being lazy since this was my first day off after a week of work; so I laid about during mid-morning. When I got up and actually left the house I decided to try a different coffee shop. Before that I stopped at the fabric store in Spanish Fork, then headed to Springville, Utah. Its not very far from I live its about 5 mins on the freeway heading north on the I-15. 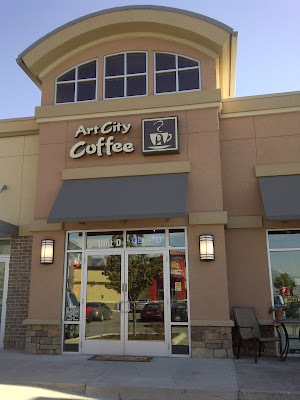 The Art City Coffee shop, is located in a little shopping center.Its kinda hidden by a fast food restuarant it sits back in a awkward place and when you see the mona lisa your there. parking is not that all that but your able to find a space. When you come in its a long semi-narrow store, the register is right off the front doors. When looking straight towards the back of the coffee house you can see there is a little stage for performances, couple of tables not a whole lot and to the left of the wall there is a long table against the wall facing some local artists work. The only light is coming from the front of the store of course there is lights. But it seems kinda dim when looking towards the back. Its quaint, very small. When I was there was just several customers, very low key. But a good place to read, just relax. I came in an order an ice coffee with white chocolate and amaretto. When the barista was making my drink she told me she ran out of ice coffee. I was kinda bum but she suggested an americano. I said yes, eventhough I don't really like them. Its too strong for me, this time I opted to try it since I need some caffeine really bad. The barista, was very nice about it and I think she charged me a for a ice coffee.I had to have some flavor and soy. in my americano I can't take it straight, yes I'm a chicken. It was very tasty, was not bitter, or had that strong taste. I think she put a lil too much of the syrup.I didn't care at this point I needed my caffeine but I was very happy to drink my very first americano.I give two thumbs up. I like coming to Art City, when I do have the chance. I just forget its there and I'm always in a hurry to get where I need to go. But when I do, I usually try to pick one up when I'm in the area shopping. I try to give back to the local business. If you wanna check it out the address is: Art City coffee 484 south 1750 west Springville Utah . Just take freeway exit 260 from I-15. If your coming from the North or South. you head towards the east and right off the freeway; you will see it on your right. always try something new.